Incomtus 1 year, 6 months ago. Lineage OS 14.1 for Xiaomi Redmi 4x (santoni) has arrived via an unofficial build. If you want the OFFICIAL update or some more Lineage ROMs then stay tuned to the LineageOS 14.1 page or the latest LineageOS 15 Android O devices list page. This Redmi 4x Lineage OS 14.1 (santoni) is brought to you by SamarV-121. No donation link found for SamarV-121. THIS IS AN INITIAL BUILD WHICH MAY NOT BOOT AT ALL OR EVEN IF IT BOOTS IT MAY HAVE MANY BUGS. HAVE A BACKUP OF THE CURRENT ROM BEFORE FLASHING THIS ROM AND TRY AT YOUR OWN RISK. Installing a custom ROM on a Redmi 4x (santoni) requires the bootloader to be unlocked on the Redmi 4x (santoni) phone, which may VOID your warranty and may delete all your data. Before proceeding further you may consider backup all data on the phone. You are the only person doing changes to your phone and I cannot be held responsible for the mistakes done by you. Then download and Copy the GApps and LineageOS 14.1 for Redmi 4x ROM ZIP to your phone. First flash the Redmi 4x Lineage OS 14.1 ROM ZIP from device. Reboot and Enjoy the Nougat 7.1 Lineage OS 14.1 ROM for Xiaomi Redmi 4x (santoni). 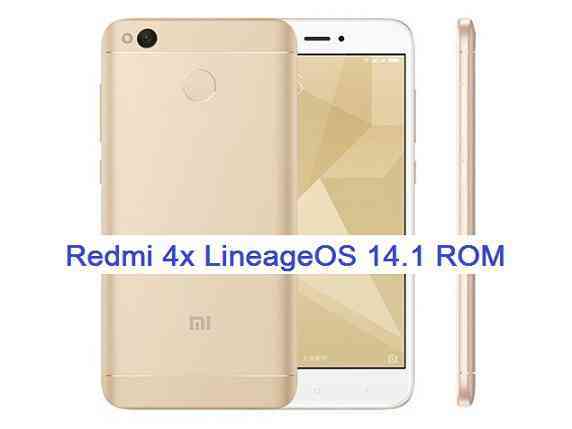 Copy the latest Lineage OS 14.1 for Redmi 4x ROM ZIP file to your phone. Stay tuned or Subscribe to the Xiaomi Redmi 4x (santoni) LineageOS forum For other Android Nougat ROMs, Lineage OS 14.1 ROMs, other ROMs and all other device specific topics. xposed for N isn’t ready yet, dude. You are OT. Thank’s a lot for this ROM built. It works pretty nice and fluid, the battery life is similar than the Xiaomi one. I have only one litle issue, it’s about the physical buttons. The recent button thasn’t work, but it’s not a real problem for me because I prefer the virtual keys, in special in this phone (in my case in black color) where the buttons are practicaly invisivel in the black body frame. I just root the phone in the developers options, and then with the “soft key” apk, install the virtual buttons and disable the physical ones. Maybe in future version, you can provide this option to enable the virtual keys in the buttons settings. Good work, and thanks for your job. Nice ROM. Minimalistic and powerfull, that’s what I like. One thing. MIUI 9 Dev (i.e. Android 7) need to be installed before this ROM, otherwise gyro and position sensors not working. I have a bug, once I tried to power off the phone (either by pressing POWER botton or issuing “reboot -p”), the phone kept rebooting forever. So there is no way to turn off the phone. I must keep the phone on forever. Hello! I installed the linageos on my redmi 4x and it works very fine. Recent app button is not recognized as a recent apps button but as a mebu button so i can’t change its functions in the parameters…. That for now the only problem.